Too many regulations? | Save Palo Alto's Groundwater! The stories and photos coming from Texas (and likely soon from Florida) are sobering and, some, heartbreaking – they are a reminder of what can happen and what did happen in a much smaller way in Palo Alto during the February 1998 winter storm. 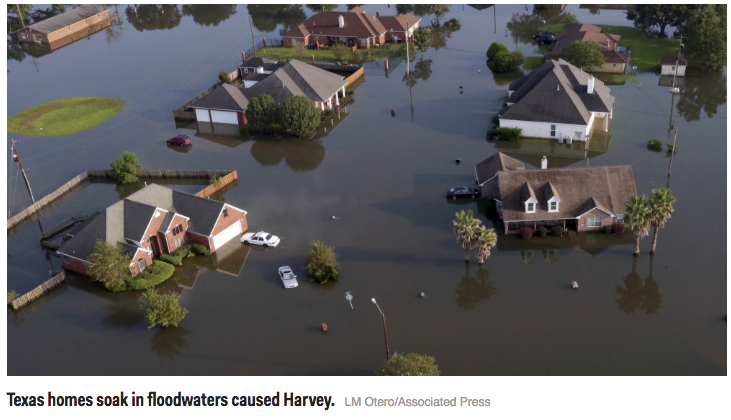 Although unprecedented amounts of water fell on the Houston area, experts say ,  that among other measures, having and implementing zoning regulations could have minimize the impact of the storm. A neighbor mentioned that she is opposed to regulating dewatering for basement construction because “we already have too many regulations”. While too many regulations might feel like being “nickeled and dimed”, what if those regulations actually improve our lives and our safety? In the case of dewatering for underground construction, regulations that limit or eliminate the waste of shallow groundwater can protect this resource for use in future droughts. Additionally, instead of pumping this shallow groundwater and shunting it to the Bay, a sustainable amount of this groundwater could be used for current non-potable needs such as irrigation. This would decrease our use of ever more scarce and expensive potable water. Beyond dewatering and with the floods in Houston in mind, we know that soils regulate the flow of stormwater (plus sequester carbon dioxide, a greenhouse gas). With ever more underground construction, we are removing this soil and it will no longer be available to retain stormwater and release it slowly over time. Thus, we increase the chances of flooding in our neighborhoods. As the failure of the Oroville dam demonstrates, flood protection infrastructure can be overwhelmed, despite the assurances of planners. And, when overwhelmed, the damage can be extreme. With expected sea level rise the groundwater level will concurrently rise. As with underground construction, there will be less soil available to retain stormwater and release it slowly over time. This means that areas not currently in the FEMA flood zone are more likely to have flooding in the near future. Should we be building basements and underground garages in these areas? According to the USGS, underground construction in which the groundwater level is currently at 13 feet or less is at risk of flooding within its lifetime. For these reasons, shouldn’t we be regulating underground construction to ensure it’s in the right place and impacts are minimized? Times and circumstances change. We should eschew regulations that are no longer applicable and enact regulations that reduce risks to public safety and protect our properties, infrastructure and natural resources such as shallow groundwater and soil. These resources are vital to our safety and well-being and that of future generations. We believe we all have a responsibility to see that these resources are not squandered and that private development doesn’t increase public risks. 4 Responses to Too many regulations? The main issues here are the drought and earthquakes. Both of these are affected by ground water pumping. We do not need more basements in this community, as they were not built previous history for many good reasons. We have people now moving to this city who want the extra room for their own purposes. The city is wise to finally provide regulation for this problem. Money is creating many second thoughts. I hope the city continues the path for more regulation. Thank you Carl for your thoughtful post. I urge you to come to City Council meetings and speak your mind. The 2018 regulations for dewatering will likely be discussed in Oct or November. I hope you will join the voices against continuing this wasteful and very short sighted practice. Thank you Esther. Too bad more people are not paying attention to the “large” picture and consequences of dewatering. When only a few used dewatering it was not a problem. Now with so many commercial, governmental and residential buildings “going deep” it certainly becomes a concern. Our ground water is not limited and soils have a purpose. Too bad a moratorium on dewatering for all buildings was not established while our groundwater levels and circumstances are investigated. There is an excellent article in Metro (September 6-12) titled Coastal Warning about Gary Griggs’ new book: “Coasts in Crisis”. The book discusses disappearing Coasts, states Climate Change could bring Harvey-type disasters to the Bay Area and how to prepare-NOW. Excellent reading. Climate change is real; the action we take to deny or prepare is important. I urge reading of this excellent article. Become informed and involved. Become part of The Power of One.